Two commenters (Jack B. and John L.) raise an important point about the $25 billion price tag that the Congressional Budget Office recently placed on the Troubled Asset Relief Program. Their concern is that the $25 billion figure includes some impacts that should rightfully be attributed to other government actions, not to TARP itself. To illustrate, suppose that Treasury used TARP to buy $10 of preferred stock in Bank X in 2008 and that a year later Treasury sold its position for $12, including accrued dividends. This investment would be recorded as achieving a $2 profit in TARP (subject to one technical caveat, see below). That’s the normal way of calculating profit on an investment, and is what CBO was instructed to do for its part of TARP oversight. But as Jack and John point out, there’s an important complication here. 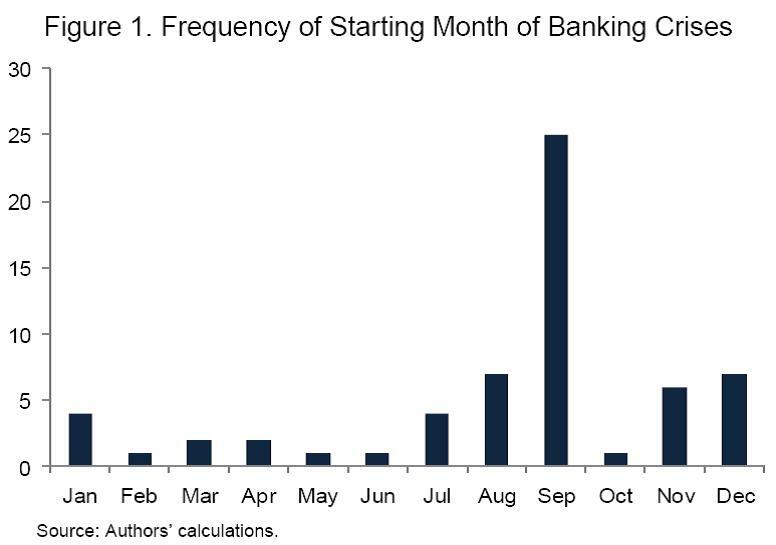 During the year, the federal government undertook many other policy actions which may have boosted the value of Bank X (remember all the new acronyms?). From the perspective of policy evaluation, some or all of the $2 gain should be attributed to those other policies, not TARP. It could be, for example, that absent further action, Bank X would have struggled, leaving Treasury with stock worth only $6. Other government actions, however, breathed enough life into the company (or, at least, boosted the value of its assets) that the stock ultimately became worth $12. In that case, you could argue that TARP, by itself, resulted in a $4 loss, while the other government actions created a $6 gain. That puts the budgetary impacts of TARP in a different light: a 40% loss versus a 20% gain in this example. Of course, you could also argue that the $6 gain was only possible because of the TARP ownership stake. There’s certainly an element of truth to that. But the basic concern still applies: the $2 gain in this example reflects both TARP and subsequent government actions, not just TARP alone. That’s an essential point when trying to evaluate these policies after the fact, and we commenters should keep that in mind when interpreting CBO’s findings. And that’s not all. The other government actions may also have imposed additional direct or indirect costs on the federal budget. As a result, the $2 gain in this example may be offset (or more) by other costs that aren’t included in the calculation. Bottom line: One reason that TARP appears much less expensive than originally predicted is that many of its investments benefitted from other government actions whose costs show up elsewhere in the budget. 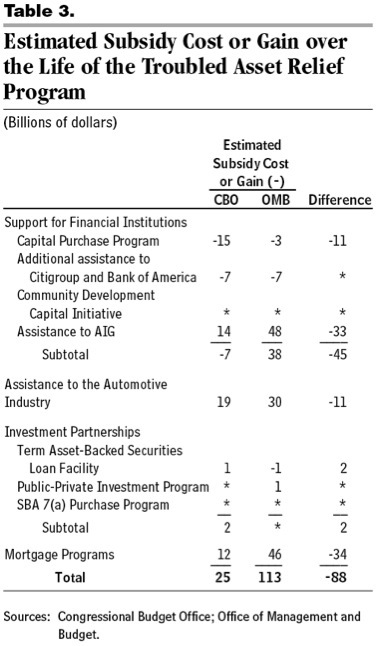 Caveat: CBO’s methodology actually judges the profitability of investments relative to benchmark rates of return. The details are surprisingly complex, but just for purposes of illustration, suppose that the appropriate benchmark rate of return for investing in Bank X was 10%. If Treasury sold the stock for $11 after one year, CBO would deem that as breaking even. If it sold it for $12, that would be a $1 profit. The much-maligned TARP program will cost taxpayers only $25 billion according to the latest estimates from the Congressional Budget Office. That’s substantially less than the $66 billion CBO estimated back in August or the $113 billion that the Office of Management and Budget estimated in October. The good news, budget-wise, is that the government is on track to make about $22 billion on its assistance to banks. However, CBO estimates that TARP’s other activities will cost $47 billion. This reflects aid to AIG ($14 billion), the auto industry ($19 billion), mortgage programs ($12), and a few smaller programs ($2 billion). [M]ake sure that the direct costs of TARP are paid for by the major financial institutions, not by the taxpayer. Assessments on these institutions will be determined by the risks they pose to the financial system. These risks, the combination of high levels of riskier assets and less stable sources of funding, were key contributors to the financial crisis. The fee would be applied over a period of at least ten years, and set at a level to ensure that the costs of TARP do not add to our national debt. One year ago we estimated those costs could exceed half a trillion dollars. However, we have been successful in repairing the financial system at a fraction of those initial estimates. The estimated impact on the deficit varies from $109 billion according to CBO to $117 billion according to the Administration. We anticipate that our fee would raise about $90 billion over 10 years, and believe it should stay in place longer, if necessary, to ensure that the cost of TARP is fully recouped. As noted by other participants in today’s hearing, the bank tax raises a host of questions: Is it possible to design the tax so that it is ultimately paid by major financial institutions (by which I presume Geithner means their shareholders and top management), or will it get passed through to their customers? How much, if at all, would the tax reduce bank lending? Is it fair to target the banks even though the bank part of TARP actually made money for taxpayers? Would the tax reduce risks in the financial system? Those are all interesting questions, but today I’d like to highlight another one: Can Congress embrace the idea of a bank tax that would be used to “ensure the costs of TARP do not add to our national debt”? As described by the Administration, the bank tax would be used to reduce the deficit, thus offsetting budget costs of TARP. Congress, however, is hungry for revenues that it can use to offset the budget costs of new legislation, e.g., extending the ever popular research-and-experimentation tax credit or limiting the upcoming increase in dividend taxes. With PAYGO now the law of the land (for many legislative proposals), some members are looking at the $90 billion of potential bank tax revenues as the answer to their PAYGO prayers. All of which points to a looming budget battle: Will the bank tax be used to pay off the costs of TARP, as the President has proposed, or will it be used to pay for other initiatives? After being turned down by bank after bank, Fochler came across the Latino Economic Development Corporation, a nonprofit microlender based nearby in Washington, D.C.
Fochler is not Latino, but he was told that was OK. The LEDC works with all kinds of local businesses that have been turned down by traditional banks. Their goal is to help fledgling, independent businesses get on their feet. They don’t operate exactly like microlenders in the developing world, some of which issue interest-free loans and let recipients repay whatever they can, whenever they can. In contrast, American microlenders charge competitive interest rates, and the loans must be repaid on time. Defaulting on a microloan has the same consequences as defaulting on a bank loan. The LEDC issues loans ranging from $500 to $50,000. Often in the past, those who came to the LEDC to apply for a microloan had little or no credit history. But Rob Vickers, director of lending at the LEDC, says the profile of his average microloan applicant changed dramatically during the credit crisis. As noted, it isn’t exactly the same as the microlending made famous in developing economies. But it has some interesting similarities. For more, read the transcript on which the NPR article is based.